OKLAHOMA CITY IS ROLLING, AND THE NBA IS FINALLY SEEING WHAT THE THUNDER CAN DO. Just a short month ago, Russell Westbrook sat on the bench with his head down, crushed, in an iconic moment of the Thunder season. The Thunder had just gotten beaten by a bad Orlando Magic team that were coming off a long losing streak. Nothing offensively was working. Shots weren’t falling. Everything was a little out of sync. That moment marked a turning point for a team that had been struggling with on-the-court chemistry. Behind the scenes, every source said the team was together and working towards success. It just hadn’t translated. Since that moment, the Thunder have gone 12 and 3, are sitting on the longest winning streak in the NBA (six games), and have shown at least some of the potential that had analysts talking at the start of the season. It’s been a big turnaround for the boys in blue. What’s been the impetus behind the winning streak? There are a lot of things that go into it, maybe chief among them the big 3 finally starting to hit shots they should make. But here are 3 factors that you might not have considered. 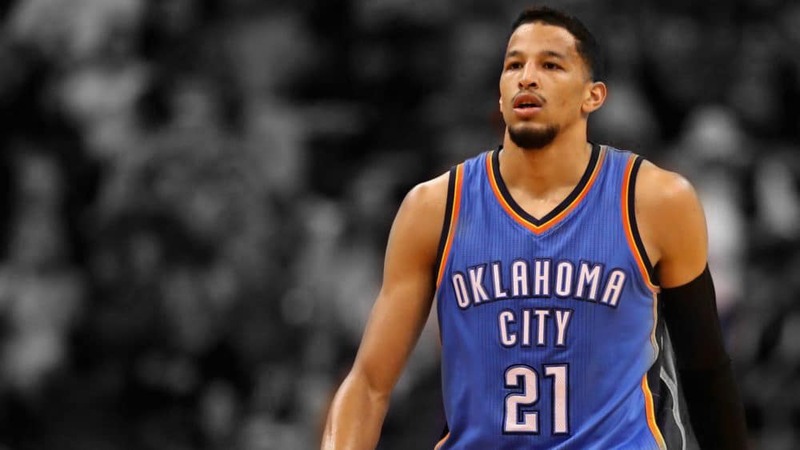 Andre Roberson’s a woeful shooter, as just about anyone with a passing understanding of the Thunder can tell you. For his career, he shoots 25% from the 3-point line and 48% from the free-throw line, percentages that make DeAndre Jordan blush. But he still provides value because his defense is incredible, especially when he’s generating turnovers that supercharge the Thunder’s transition offense. Despite his almost total lack of offensive game, the Thunder are still a net positive with him on the court. This year more than ever, though, teams are getting smart about leaving non-shooters on the perimeter. Roberson’s not a natural cutter, and most of the Thunder’s plays had him parked in one corner, watching helplessly as the play unfolded around him and occasionally catching a backdoor lob or shooting an errant 3 when his opponent got bored of keeping an eye out for him. The Thunder started to pull out the Roberson pick and roll, a set that’s rarely used during the regular season. They’ve also started to use him at the wing instead of in the corner, a position that takes advantage of one of his few positives on offense: decent passing vision. When he’s at the wing, he’s more capable of making a play or cutting to the basket; while in the corner, there’s usually only one or two options for what he can do. Roberson’s an above-average passer, and though his offensive strengths are limited, the Thunder are starting to try to use him more effectively. It’s a known truism that players who touch the ball more on offense also tend to be more engaged defensively, and though Roberson takes the most pride in his defensive game, it can only help if his offensive touches are more impactful. It also makes the Thunder offense less predictable, and having more guys involved in the play can mean better-quality looks. If the Thunder can figure out a way to keep Andre involved and minimize his weaknesses, they’re in a good position moving forward. The Thunder have had several players with minor injuries and/or platelet-rich plasma injections on their knees this year. Westbrook, Abrines (though his was earlier), Roberson and Patterson all had offseason procedures, and Westbrook has made a few passing comments that indicate he wasn’t as active this summer as he usually would be—in between having a baby, starting fashion lines and jetting around to all his offseason engagements, he probably got a little less time in the gym than he’d like. This might be a big reason why Westbrook, Roberson and Patterson didn’t seem like their usual selves coming into the season. Whatever the case, it seems like it’s worn off. Clutch time tends to be more controlled by variance than the average fan thinks, with very few teams over- or under-performing their expected wins for the season consistently. The Thunder way underperformed their net rating to start the season, but in this recent winning streak they’ve way overperformed. Some of this may be Westbrook rounding into form—the Thunder overperformed last year, and it’s not inconceivable that Westbrook may be one of the few capable of breaking the average—but it’s more likely that the Thunder are neither as bad as the team that started out the season nor as good as the team that we’re seeing right now. Don’t start counting rings now. It’s December. But do get excited about this Thunder team, which is playing some of its best ball right now and showing signs of fixing some of the problems that plagued them since the beginning of the season.